For more than two decades, legendary trainer Tim Grover has taken the greats, Michael Jordan, Kobe Bryant, Dwayne Wade, and dozens more and made them greater. Now, for the first time ever, he reveals what it takes to get those results, showing you how to be relentless and achieve whatever you desire. Direct, blunt, and brutally honest, Grover breaks down what it takes to be unstoppable: you keep going when everyone else is giving up, you thrive under pressure; you never let your emotions make you weak. In "The Relentless 13," he details the essential traits shared by the most intense competitors and achievers in sports, business, and all walks of life. Relentless shows you how to trust your instincts and get in the Zone; how to control and adapt to any situation; how to find your opponent's weakness and attack. Grover gives you the same advice he gives his world-class clients, "don't think" and shows you that anything is possible. 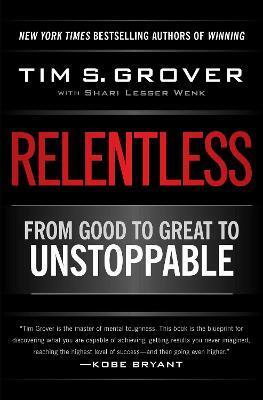 Packed with previously untold stories and unparalleled insight into the psyches of the most successful and accomplished athletes of our time, Relentless shows you how even the best get better . . . and how you can too. Tim S. Grover is the preeminent authority on the science and art of achieving physical and mental dominance. Since 1989, he has been the CEO of Attack Athletics, appearing around the world as a keynote speaker and consultant to business leaders, athletes, and elite achievers in any area who want to know how the best can get better in anything they do, teaching the principles of relentless drive, result-driven performance, and mental toughness. A featured columnist at SI.com and Yahoo.com, he also appears regularly on ESPN and other media outlets. He is the author of the national bestseller Relentless: From Good to Great to Unstoppable and creator of digital training platform "The Relentless System." He is based in Chicago. Shari Lesser Wenk, co-writer of the bestselling Start Something by Earl Woods and the Tiger Woods Foundation, has worked on sports books as a literary agent, editor, and ghost writer since 1983. She lives in Chicago.